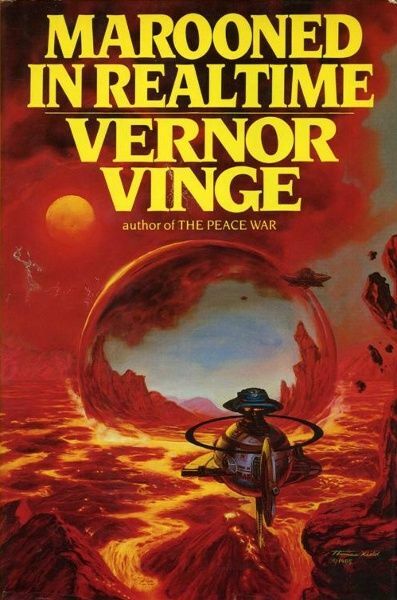 Vernor Vinge, author of A Fire Upon the Deep, published his first short story in 1966, and his first novel, Grimm’s World, in 1969. Even he has a forty-year-long writing career, he wrote only eight novels and circa two dozen short stories and novellas, and many of them won various awards. 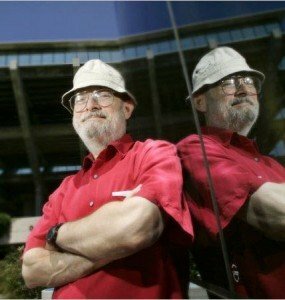 He was a professor at the San Diego State University, he retired in 2000, and his best known scientific field is the so-called theory of technological singularity, which he described in his essay “The Coming Technological Singularity” in 1993, and he deals with this scientific problem in several of his fictional works. What is your method as a writer? Before I start a story, I like to have a broad list of why the story should be interesting and what should happen, but my pre-planning is not thoroughly detailed. Compared to other writers, you are not so productive. Is it because of the circumstances, or is the years of pause between novels a conscious decision by you? Many writers are aflicted with “writer’s block” lasting for months or years. I’ve had writer’s block since about 1960 🙂 Seriously, it’s just very hard for me to write first drafts. Once I have an initial draft, I can work much more efficiently. Which one of your own characters is closest to you, and why? Marta Korolev (of Marooned in Realtime) and Ravna Bergsndot (of the Zones of Thought novels). Both are characters who truly and with some effectiveness try to do good things and to bring cooperation between much more cantankerous persons. You are a successful writer and scientist at the same time. As we all know, a scientific career requires a full man. How could you reconcile these two paths, and did they affect each other? The two paths had both positive and negative effects on each other. The conflicts made some things go more slowly, but they also provided inspirations. What is your point of view on the rapidly developing and changing accomplishments in the fields of computers, and how much of these can you use? I think computer and network progress is taking us toward a change as profound as any in the history Life on Earth. This can inspire science fiction ideas, but also makes realistic stories difficult to write. What is your opinion on singularity today, in 2012? I think we are on track for the schedule that I discussed in 1993. Is Rainbows End a kind of modernized sequel to “True Names”? Were there any similarities between the writing processes of these two pieces? Both stories are attempts at serious discussion of the near future (circa 2013 and circa 2025), relative to the times (circa 1980 and circa 2005) in which they were written. The writing process was quite different, however. “True Names” was short, very easy to write, and largely based on extrapolation of progress with computer networks. Rainbows End was an attempt to extrapolate a much wider range of trends in biology, communications, politics, …. Not surprisingly, Rainbows End was much more difficult to write. Where did the idea of Zones come from? I wanted an cosmology where I could have stories that did not need to confront the Technological Singularity directly. How does it feel that several of your works, for example, A Fire Upon the Deep, are considered instant classics of contemporary science fiction, and you are referred to as one of the best sci-fi writers of this era? I am super pleased that there are people with that high opinion of my writing. 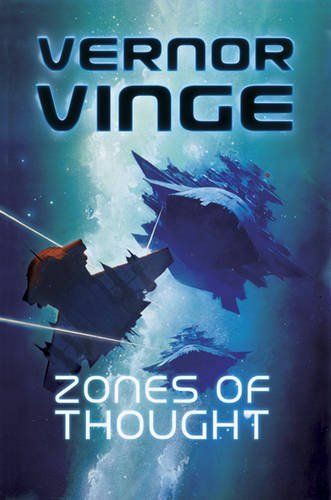 Do you have any plans for Zones novels after The Children in the Sky? I have an events trajectory that probably needs two or three more novels to complete. Do you read contemporary science fiction? Do you have any favourites among your colleagues? Yes. Banks and Brin and Schroeder and Stross and … There are so many writers that are doing great things with the strangeness of our current technology. As humanity changes, we’ll be at the beginning of whole new art forms. 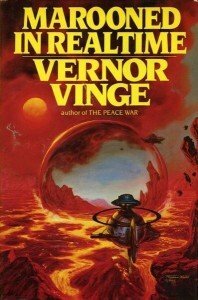 If you would have to select a work to those who are just beginning to familiarize themselves with the works of Vernor Vinge, which one would you choose, and why? Marooned in Realtime since it is an entertaining story and deals with many of the issues I have been interested in throughout my writing career. What is your opinion on the quick spreading of e-books?